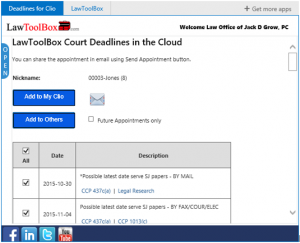 LawToolBox court deadlines for Office 365, Outlook 2003+, Google, iCal, Lotus Notes has now been integrated with Clio! 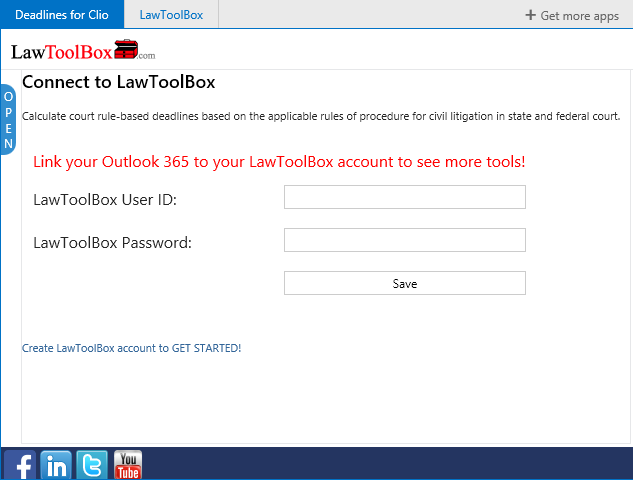 Get the “LawToolBox Court Deadline 365 App for Clio” either in the Clio Marketplace or on Microsoft’s Office.com/store. 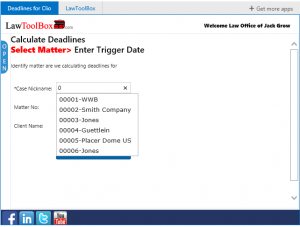 Litigators and staff can pull up their Clio matters inside their Office 365 Outlook Inbox (from any Windows, android or Apple IOS device) to instantly calculate and add their case deadlines to their Clio matters. 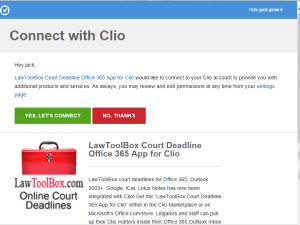 Clio customers also receive rule change notifications, can automatically recalculate deadlines (e.g., for continued trials or rule changes etc), can pull up LawToolBox case deadline charts in their Outlook Inbox, and can add select deadlines to their client’s or expert’s iCal, Google, Outlook calendars etc. 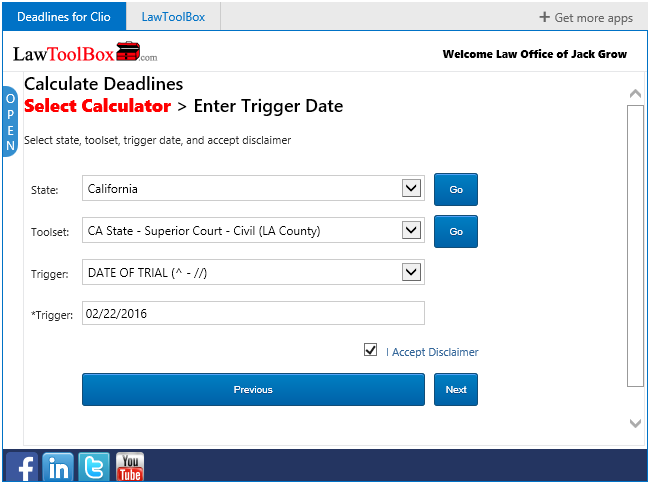 Even if you just start with our basic calculator, with LawToolBox as your deadline management partner, as your practice grows and changes you can grow and transition to even more powerful deadline management tools. Get the app today to access all these tools and more by clicking on “Deadlines for Clio” in your Outlook Inbox App Bar. 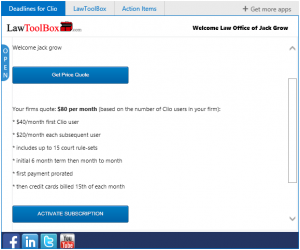 (4) Enter in the Name of your Law Firm and Click Create. 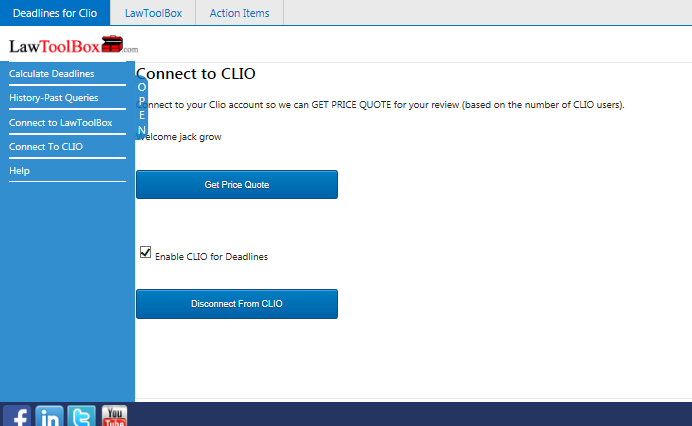 (6) Click “Connect to CLIO” to connect accounts – or click “Sign up here” if you are new to Clio. (8) Once connected, Click “Get Price Quote” > Information regarding your firms monthly fee will be displayed. 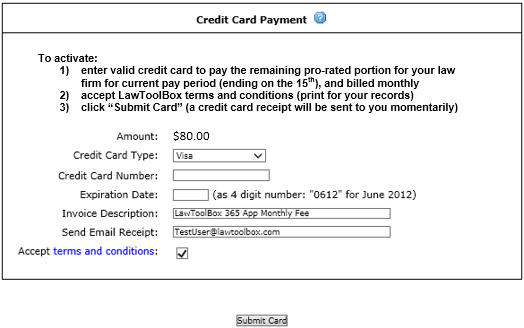 (9) After reviewing > click “Activate Subscription” and a Credit Card Payment screen will pop-up. 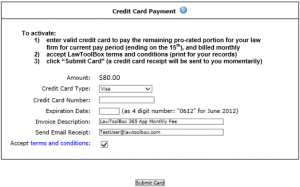 The payment information you enter will be for your entire firms account. (10) Once you finalize payment, go back to the App and there will now be a “Calculate Deadlines” option. Click “Calculate Deadlines”. 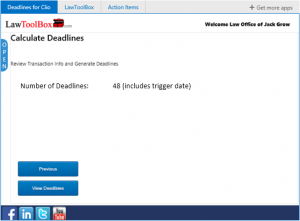 (1) Once your on the “Calculate Deadlines” page, start typing in your matter nick name. 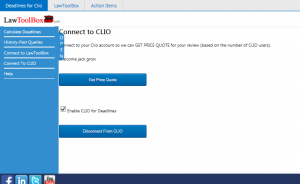 The matter information will automatically be pulled from Clio. Click “Next”. (2) Select which calculator you want to use the first time (the system will remember your choice for future docketing on that case). 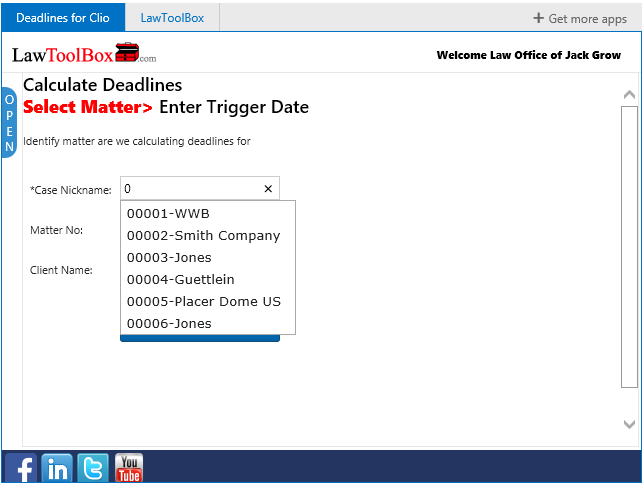 Select the Trigger Date. Enter in the date and click “Next”. Please Note: All deadlines will be checked. 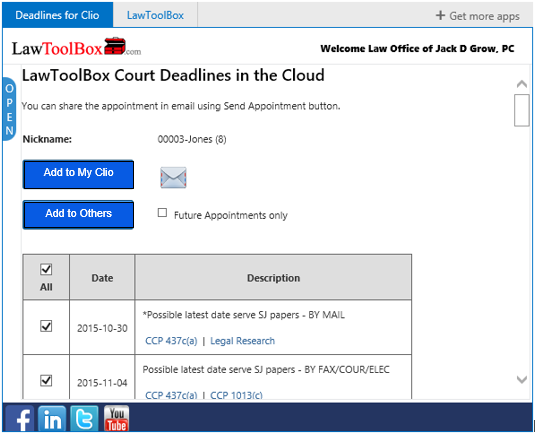 You can select the box for “Future Appointments only” to only have future deadlines added to your Clio Calendar. (B) Add deadlines to your colleague’s Clio calendars by clicking “Add to Others”. 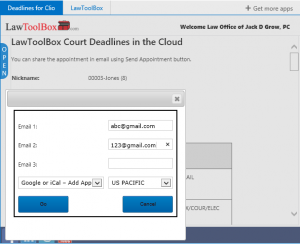 When you click “Add to Others”, you will be prompted to enter your firm members’ email addresses so that the deadlines can be instantly added to both their Clio calendar and the calendar their Clio calendar syncs with (e.g., Outlook, Google, iCal or Lotus Notes), choose time zone, click Go. 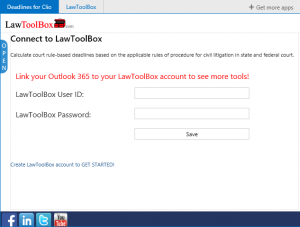 Click HERE for info on creating an Outlook Rule or Google Filter so that deadlines get automatically added to both calendars. (C) Email a copy of the deadlines to yourself by clicking on the Envelope Icon.